Ready for the latest in architecture, well maybe you have not seen it all. 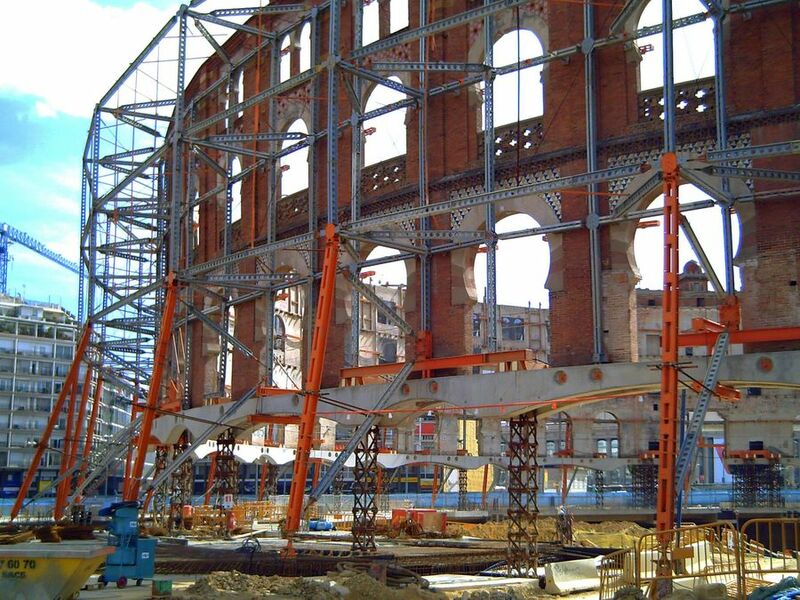 That you have to build a leisure center but you have a historic bullring such as Las Arenas in the way, no problem we call Richard Rogers the English architect we put some props under the brickwork and we lift it up to go underneath. You don´t believe it, well just check the photo I took this morning. The main purpose of this center will be to provide a link for pedestrians who want to walk between the Montjuic area where you have the Olympic stadium and some important museums like Art Gallery Fundació Miró towards Parc Joan Miró on the other side. Under a huge translucid dome enjoying the food of the many restaurants, jogging round the circular track or simply going to the cinema, people from Barcelona and tourists will be more than just pleased. Hi, did you post, last year, another photo of the bullring where you can see the whole of it, help up in the air with props? In the photo the entrance is on the left and there is a blue sky, partly cloudy. I am sorry about not using the mail. I am sure you will turn back here soon.